Each bus journey in Ecuador was a unique adventure, but common themes soon became familiar. Soon after leaving the chaos of the bus station, the bus would pull over by the side of the road and people would pour on board to sell their wares. Pots of chicken stew, meat kebabs, fruit salads, fruits on sticks, homemade ice-creams retrieved from polystyrene coolboxes, little bags of popcorn, bread, cakes, pastries, crisps, cold drinks dripping with condensation. Then once all transactions were complete, food sellers would be replaced by an evangelical preacher, or someone promoting a cure-all in a little pill bottle, or someone selling miniature leather jackets to hang from a rear-view mirror, or the latest chocolate bar. At last, instead of peace from being sold something, Andean pop would be played at an unavoidable volume for the rest of the journey. This song, in particular, followed us everywhere we went in the Andes in Ecuador and Peru; there were endless variations but it was always the same tune. Apparently this is the original, from a Bolivian band in 1982, although its roots may lie further back in folk music. This video is also a good example of the Andean pop music videos that would often accompany long bus journeys in both countries. Play this loudly for about 8 hours and you will get the idea. (The refrain may be familiar from a recent Jennifer Lopez song. When we were looking at the flat we now live in in Montreal, three girls playing in the schoolyard opposite were singing this, and we took that as an auspicious sign, as we were instantly transported back to South America). In the mountains, the bus would pick up anyone flagging it down, and Kichwa families would climb up the bus steps, small children and elderly women using our knees as support for the final step. They wore colourful clothes, with bright woven shawls, and felt fedora-esque hats, often adorned with feathers. They must have found us as fascinating to look at as we them, because we were often the subject of long, intense stares from people sitting a couple of feet away, who would still be watching us intently ten or twenty minutes later. 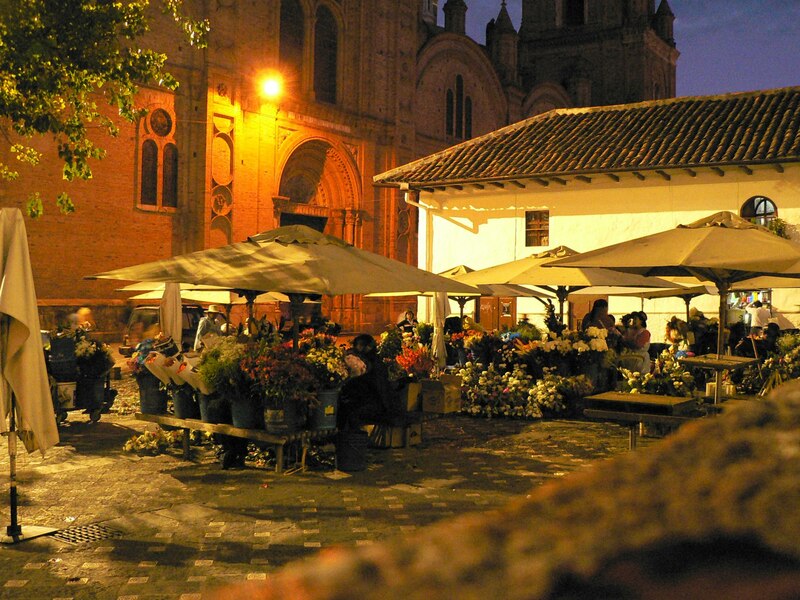 Our next journey took us from Cuenca, via Loja, to sleepy hippy dippy Vilcabamba in Ecuador’s far south. At one point we travelled through the town of Saraguro, the centre of one of the most distinctive ethnic groups in Ecuador. 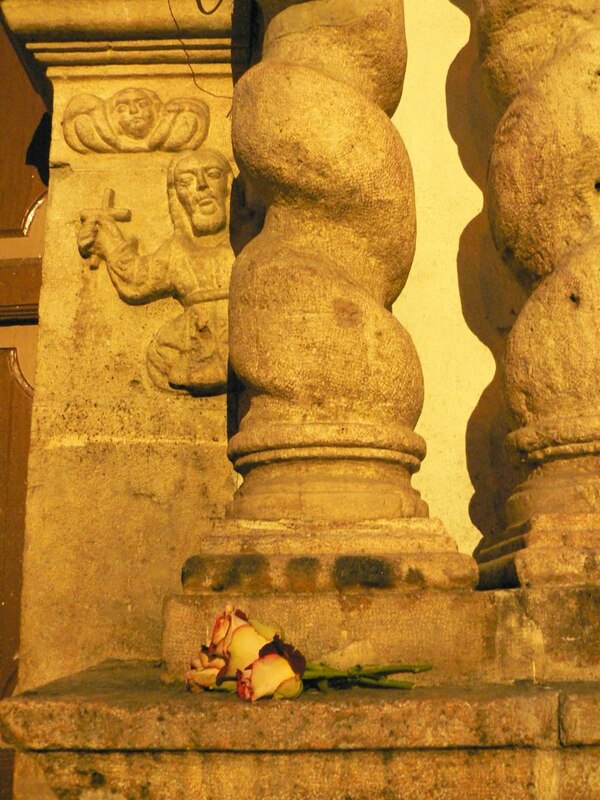 The Saraguro community was transported to this region, from Bolivia, by the Inca about 500 years ago. They dress largely in black, men wearing knee length trousers, and both men and women wearing their hair in a single plait. Vilcabamba was a pleasant but strange place, the centre of an alternative community that seemed to have displaced the original Ecuadorian one. It was its location at the edge of Podocarpus National Park that had drawn us there. 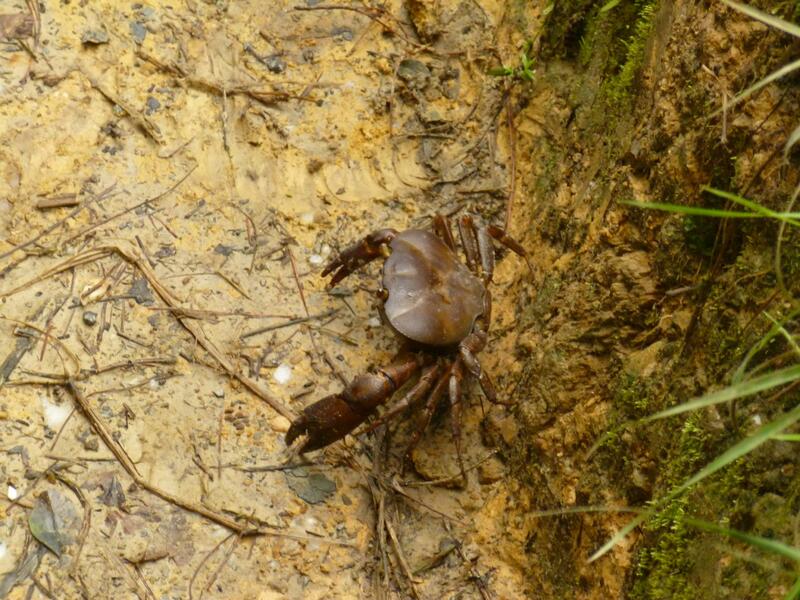 We explored the countryside around the town, surprised to find huge crabs scuttling about high up the hillside. 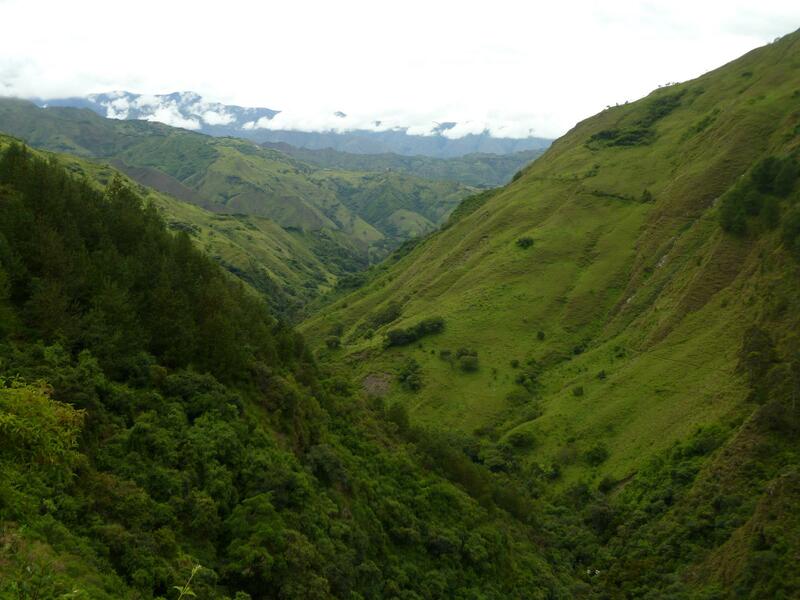 Then we headed to the National Park, which spans an elevational range of over 2000m, and is home to spectacled bears, mountain tapirs, jaguars and an abundance of bird and plant species, many of them endemic. 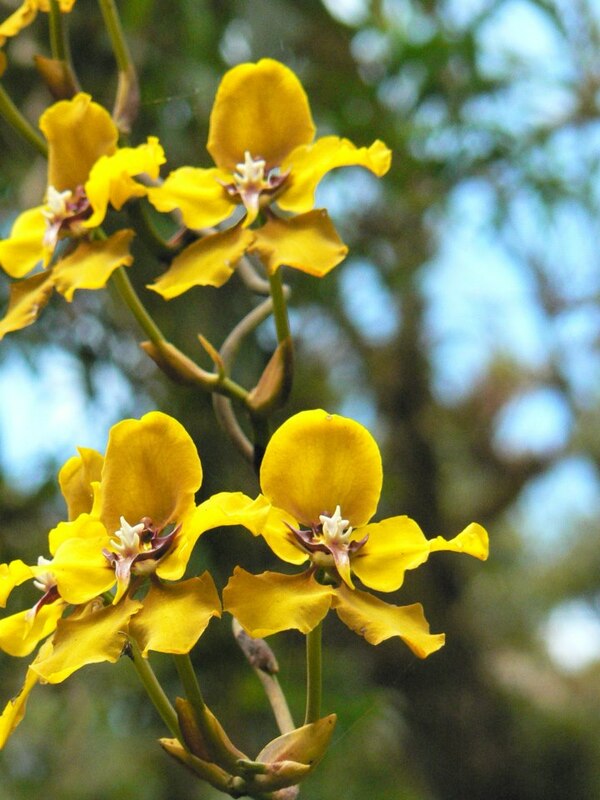 We just scratched the surface, scrambling up a steep trail dripping with bromeliads and orchids, before a climb along the jagged spine of a ridge with far-reaching views down steep forested slopes. After much deliberation, our journey onward to Peru was to be a long one, as the rainy season meant that the more direct route through a remote border crossing would be treacherous with landslides. Instead, it was to be the bus to Piura, in the Peruvian desert, and then back up into the mountains once in Peru. The journey took all day, and we wound our way along twisting mountain roads. The bus had a display which helpfully showed the speed, confirming that we were crawling along at about 20km/hour as we went uphill. After endless lush hillsides, we dropped down to the small humid border town of Macara, where we stopped for a short while. We got out to stretch our legs and took in the scene opposite, of smoke billowing from an outside grill at a neighbourhood cafe, and people heading home in the evening twilight. Then, as the light was fading, we stopped on one side of a bridge a little further along the road. A small booth on one side gave us our exit stamps, while the bus waited for us to continue our journey, and we walked across the bridge and into Peru. After a few weeks exploring northern Ecuador, it was time to head south. 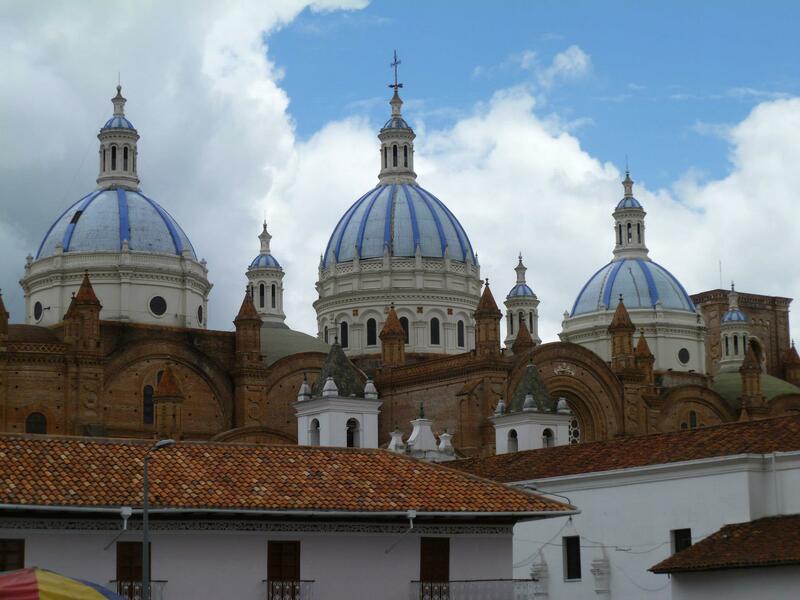 First stop, for just one night, was the small town of Riobamba. We explored the pretty main square, complete with plastic illuminated trees, and visited a small natural history museum, which was a lesson in terrible taxidermy. 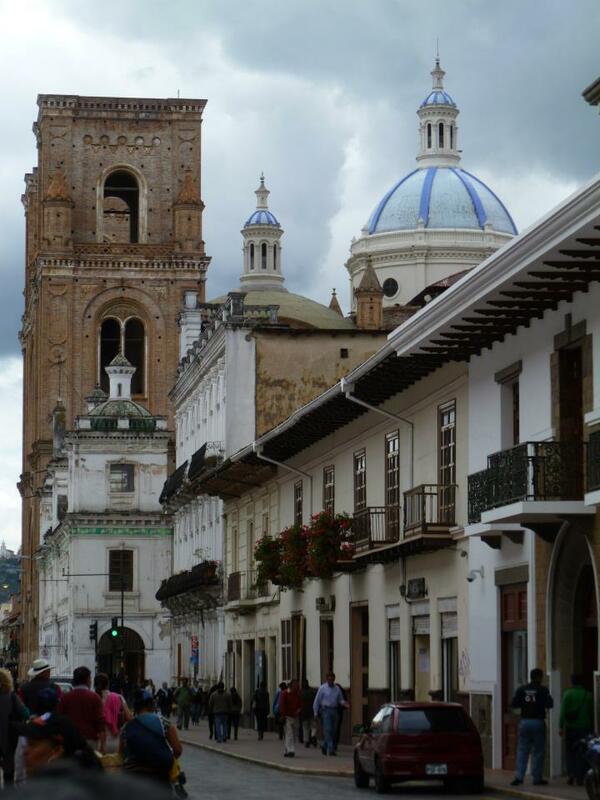 Then it was onwards to the colonial city of Cuenca, one of Ecuador’s gems. The journey took us high over the sierra, through dry and dusty terrain, and remote indigenous villages, where scraping a living from the land looked like a punishing way of life. Sheer valleys dropped away beneath us, and at times we were above the clouds. An election campaign was in full swing, and even here rock faces, derelict buildings, and road edges were used as canvases for political slogans, advertising candidates, a surprising number of whom had names such as Stalin, Mao, and Lenin. The people we passed, and shared the bus with, wore colourful traditional clothes, in vivid contrast with the grey landscape. But to assume they lived in the past would be an injustice, and they retrieved their mobile phones from folds of clothing. We broke our journey with a visit to Ingapirca, one of the northernmost Inca ruins, a remnant of the great empire that extended across parts of what is now Colombia, Ecuador, Peru, Bolivia, Chile and Argentina. 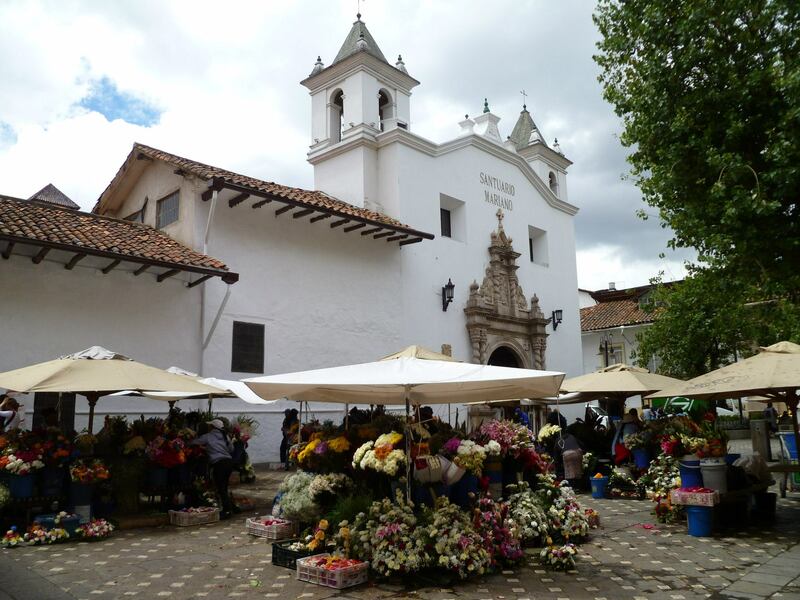 Cuenca is a perfect city for aimless wandering along pretty streets, and as we explored we soon found ourselves in the lush, plant-filled main plaza, in front of the cathedral. A military brass band played in front of a government building, and an elderly man gave speeches in between the musical numbers, and danced along while they played. Another square close by, in front of a beautiful church, was filled with flower stalls. We indulged in perfectly ripe avocadoes, delicious tropical fruit ice-creams, and little bread roll doughnuts filled with amazing blackberry jam. 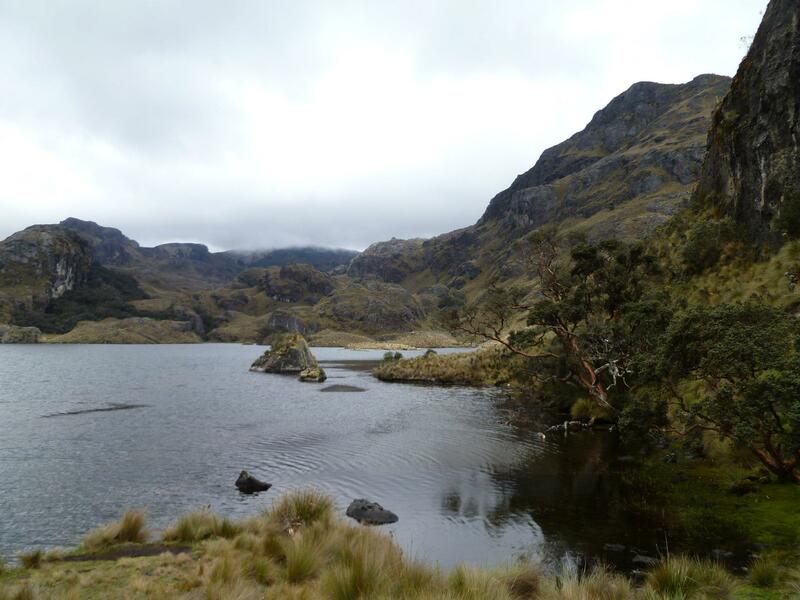 The next day we headed to Cajas National Park, with the landscape shifting from tropical to Scottish highland over the course of an hour or two. We arrived at the main entry point, just below 4000m, to find what looked like Skye but on a much larger scale. 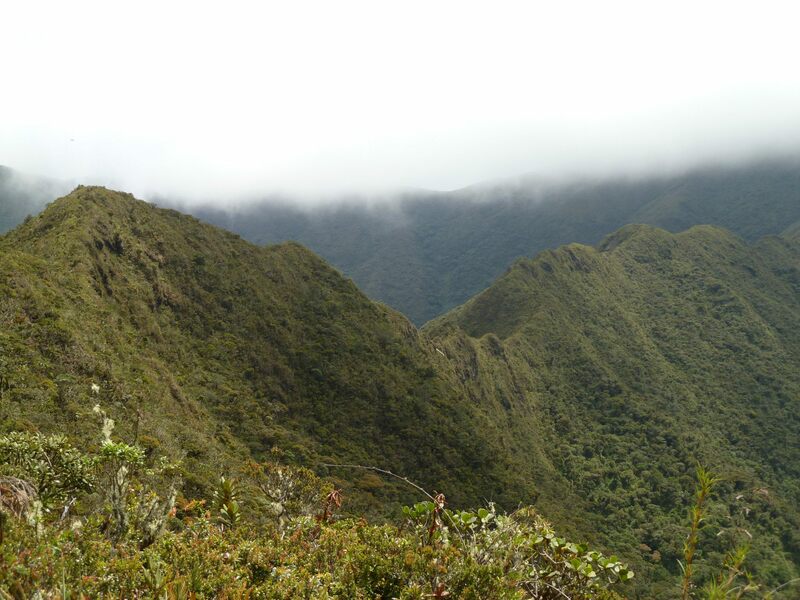 Rugged mountains and craggy peaks, with lakes studding the high-altitude paramo vegetation in all directions. We followed a trail which took us through a Polylepis forest, a fairy tale wood of Queñua trees (no, not that kind) with gnarled trunks and peeling red bark, then past spiky plants and grass, bogs and lakes. 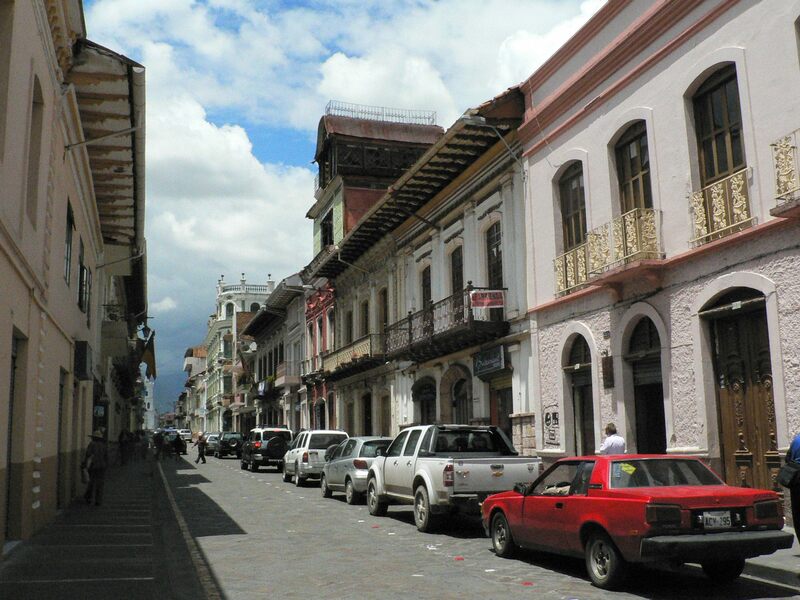 Back in Cuenca, the afternoon sun combined with the music on the taxi radio made it feel like we were in a film, an Ecuadorian soundtrack accompanying our drive through the narrow streets. The churches were illuminated as night fell, and the flower market was packing up for the day. When we could, we would watch twilight rise and fall over the Tiputini river. Getting up in the dark, we would go and sit on the steps rising up from the dock, and then wait as the sky brightened and the forest woke up. In the evenings, tired from the day, we would watch dusk descend. One morning, the hypnotic flow of the river was broken by the quiet breaching and breathing of pink river dolphins. We heard them more than we saw them, and would often turn to see only ripples on the water’s surface, but it was magical to witness their journey past the research station at the start of the day. In the evening, we would watch as woolly monkeys busied themselves in the highest branches of huge trees on the opposite riverbank, finally settling down to sleep, and in the morning we were up before them, and saw them slowly wake up in the morning sun. 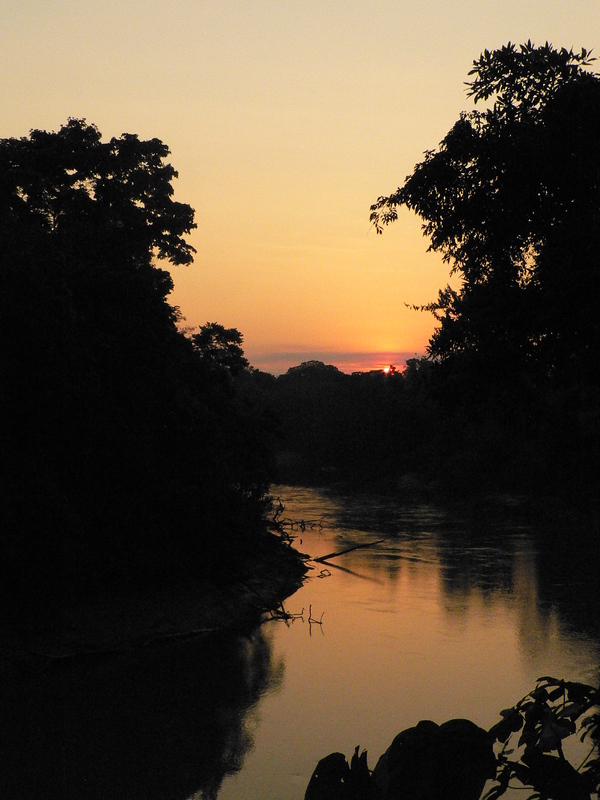 Macaws would screech as they flew high above the river to their night-time roosts, and bats would emerge when it was almost too dark to distinguish them skittering over the surface of the river. One night distant thunderclouds and flashes of lightning, and fireflies close by, added to the drama. That night, in our pitch dark cabin, we listened to the sound of one metre of rain falling over the course of just six hours. The complete darkness meant we were unable to see even a hand in front of our faces, or the outline of our cabin window, and the deafening roar of torrential rain was such that even the loudest scream would have gone unheard. It was a strange, claustrophobic night, we felt blind, deaf, and mute, and each time we woke it was the same never-ending darkness and noise. The light of daybreak and the easing of the rain came as a relief, and we finally slept well in the cool rainy morning, before heading out into the wet and froggy forest in the afternoon. One afternoon Jose took us on a long walk through the forest, sharing his great depth of knowledge with us. 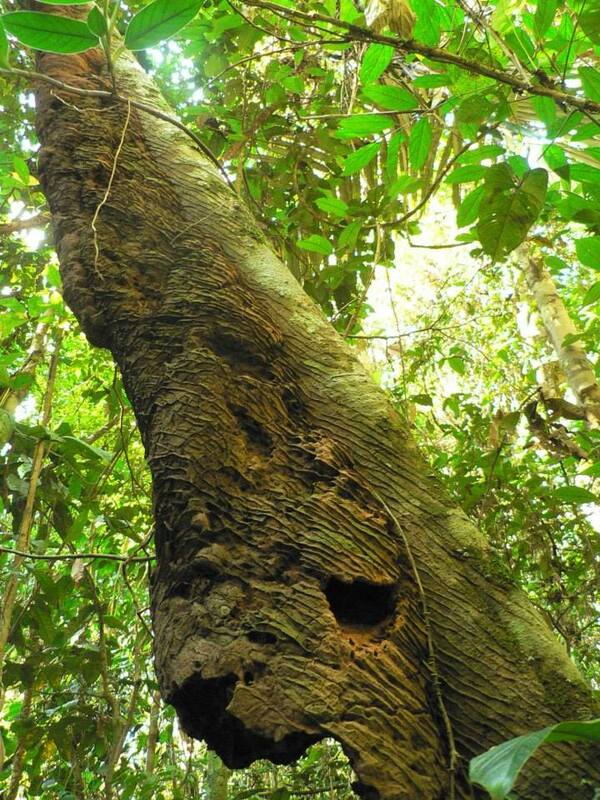 We knocked on the trunk of a tree that sounded hollow, and learnt it was the balsa tree, with cotton-like seeds. We found blobs of natural rubber, tested the insect-bite soothing properties of one vine, and kept our distance from another that was used on the tip of poison darts. We learnt that termites are great engineers, modifiying not only their nests but also the trees that they build them on, to funnel water away quickly so they avoid flooding. We saw a sleepy spider monkey lounging on a branch, and a puffbird with a large spider in its beak. 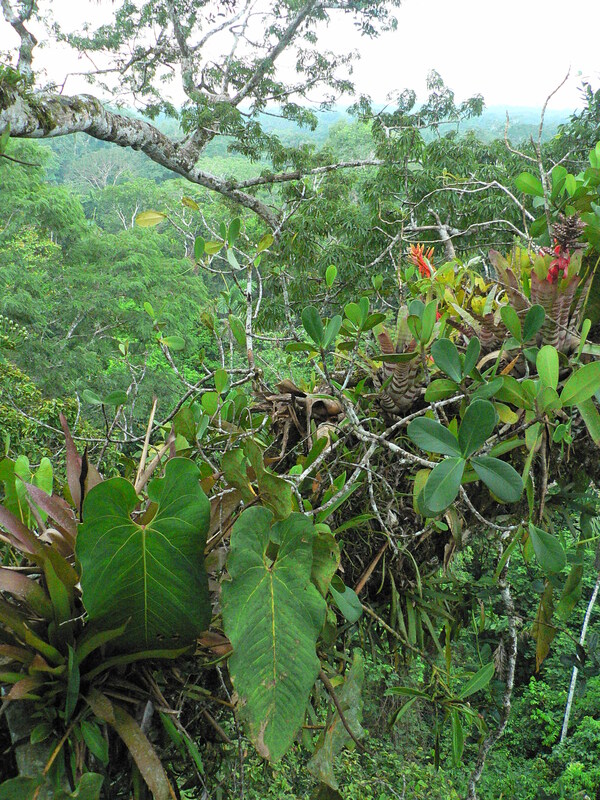 We crept up to a clay lick and watched three red howler monkeys silently climb up and away from the clay. Finally, at the end of the walk, and the end of our time with Jose, he took a palm frond, extracted lengths of fibre from it, spun it into a thread, and then wove an intricate bracelet which he presented as a parting gift, now a most treasured reminder of our time in the jungle. Our return to Quito came far too soon, and we drank in the jungle on our early morning journey back up the misty Tiputini river. It was now much higher, and flowing much faster, after the rain, and the riverbanks were submerged. A small arboreal anteater called a tamandua was battling to swim across the current, and we celebrated this final rare sighting. Tiputini Biodiversity Station sits on a bend of the Tiputini river. 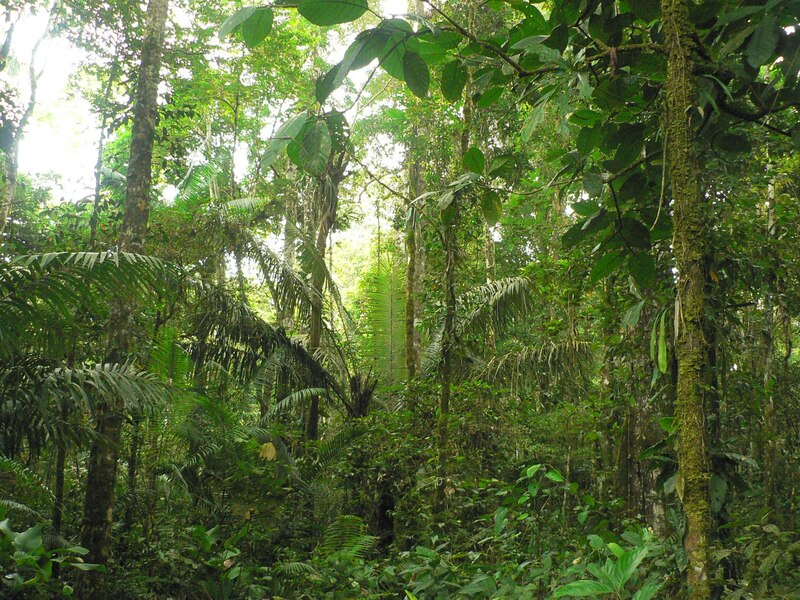 The forest on one riverbank is indistinguishable from that on the other, except that on the far side the forest lies within Yasuni National Park, a place that has long been on my wishlist of dream destinations. Jose offered to take us there, and we leapt at the chance. We set off downriver by boat, pulled into the riverbank some way downstream, and jumped onto the thick mud, following tapir footprints up the bank. 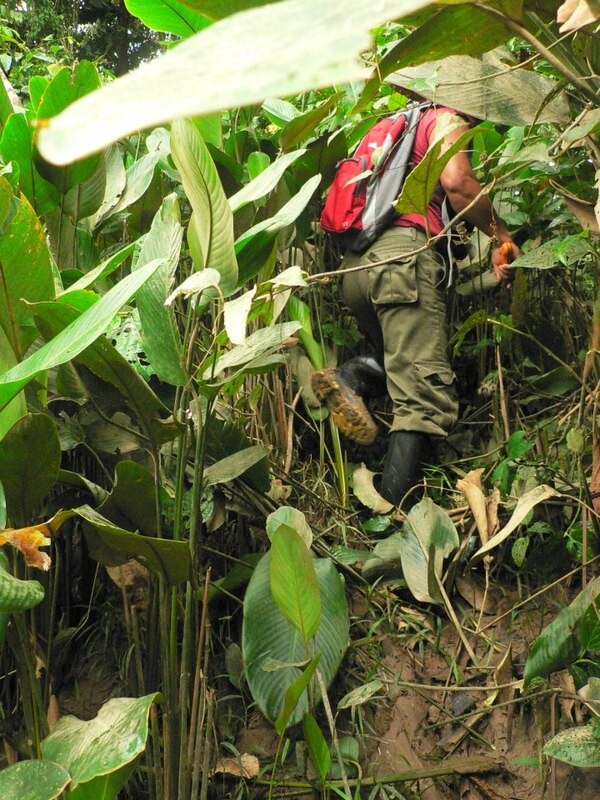 Jose led the way, machete in hand, as we stepped through the riverside scrub and into more open forest beyond. We were aiming for a clay lick within the forest, a swampy area, rich in minerals. Like the watering hole in the African bush, a clay lick is a magnet for all kinds of species day and night: the minerals in the clay are vital for a healthy diet. Jose led us under palms, across a stream where we exchanged glances with a trio of peccaries, and past a huge freshwater mangrove tree. Eventually we climbed a bank, and then we were looking down on swampy clay, bright in the sunshine, covered in footprints. A solitary parrot quietly made its way up into the branches of a tree, but we saw no other creatures. Jose revealed he had never been there before, but had led us through the disorientating jungle based on directions given to him by his brother. 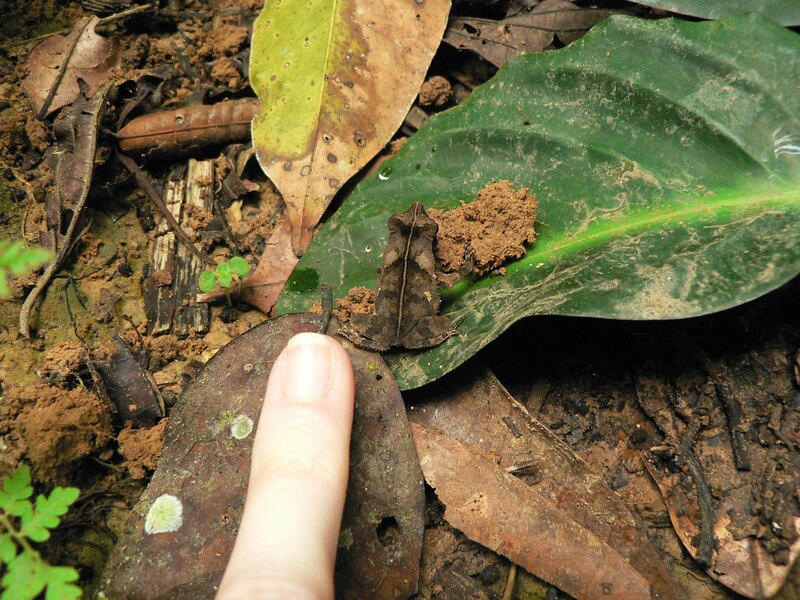 Despite not seeing so many species that morning, it was a thrill to be in Yasuni itself, and evidence of the diverse visitors to the clay lick was all around. This video, filmed in the Peruvian Amazon, gives a wonderful idea of who might have been there just before, or just after us. If you watch until the end, you might understand why I sometimes felt a little nervous during my PhD field seasons, on the trail at dawn. 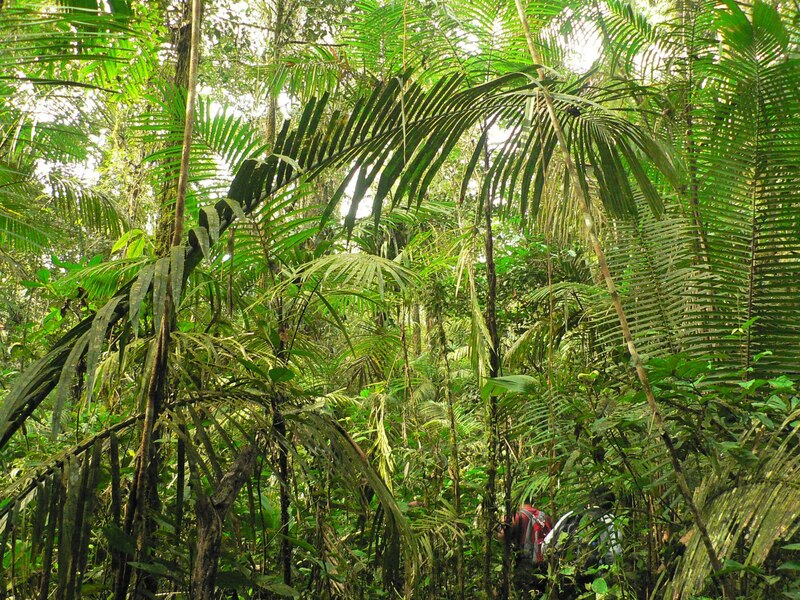 The Yasuni rainforest is a wonderland for a biologist. It jostles for position as the world’s most biodiverse place with other sites in the Peruvian and Bolivian Amazon, and Andean lowlands. It is home to hundreds of amphibian, reptile, bird and mammal species, over 1000 species of tree, and thousands and thousands of insects. Enigmatic large cats, anaconda, pink river dolphins, ten primate species, bird species ranging from the enormous harpy eagle to tiny hummingbirds, and untold undiscovered species are all here. A visit is a chance to maybe catch a glimpse of some of these, but it all depends on luck. Like stepping into a tropical greenhouse at a botanic garden, it envelops you in humidity and the smell of vegetation, but with a glorious cacophony of insect, bird and frog calls. A hundred shades of green hide almost all animal life to the untrained eye, but with time the animals become easier to see. 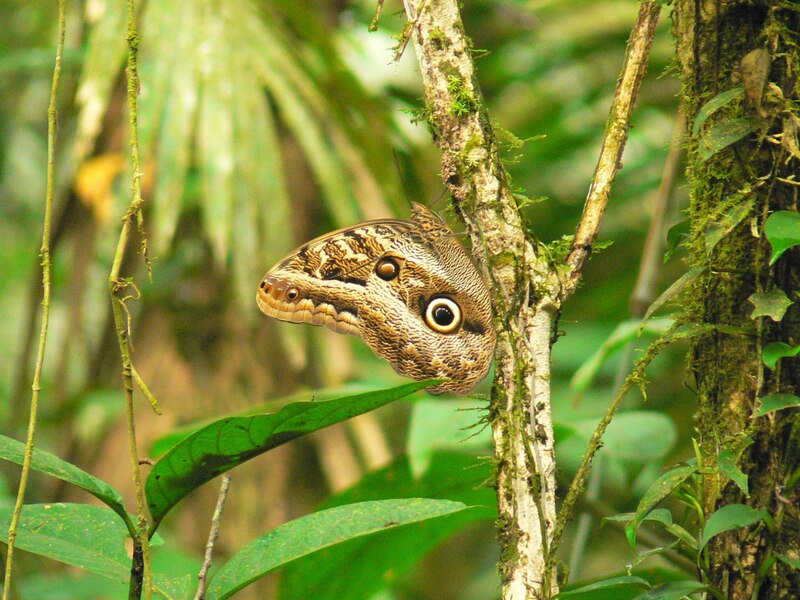 The noise in the canopy that you initially confuse with leaves in the wind alerts you to monkeys, the forest floor becomes alive with camouflaged frogs and insects, and butterflies dance across your path. Birds are easier to hear than to see, but a hummingbird may pause, hovering inches from your face, as it zips along it’s flight path, and the croak of a macaw means you can catch a flash of red as it flies over the canopy far above. 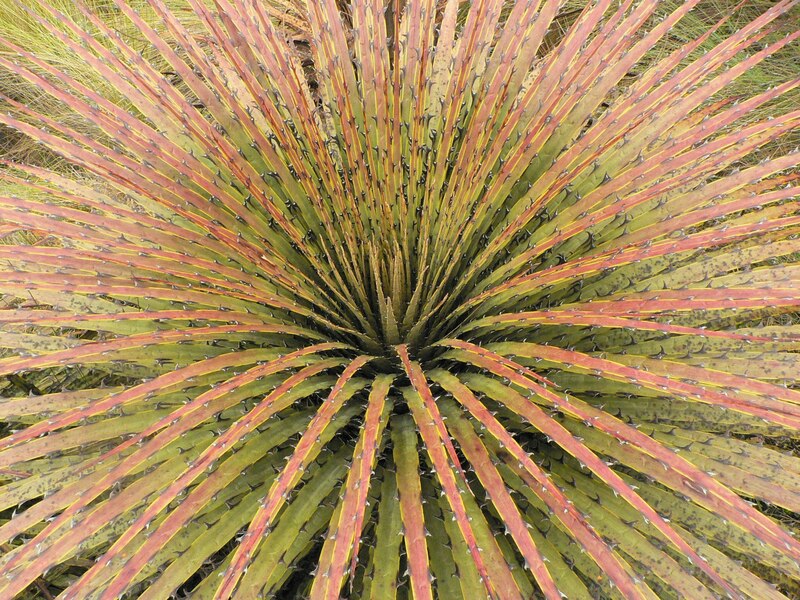 Your eyes become trained to notice movement, and with time you see more and more. 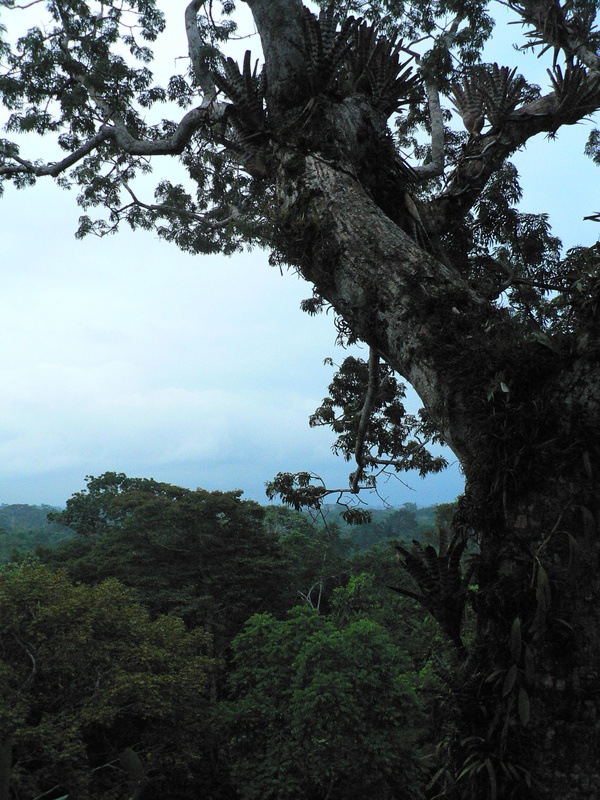 We arrived for a week at Tiputini Biodiversity Station – just across the river from Yasuni National Park proper – full of anticipation. We knew all these species were all around us (and with camera trapping projects run by the station, it is sometimes unnerving to realise just how close some of these species regularly are), but it would be mostly down to luck, combined with the infinite skill and knowledge of our guide, Jose, that would determine what we would see. We started in the canopy, high above the forest floor, at dawn on our first morning. We set off in the gloomy pre-dawn light, straining to see the trail and not trip over any tree roots. 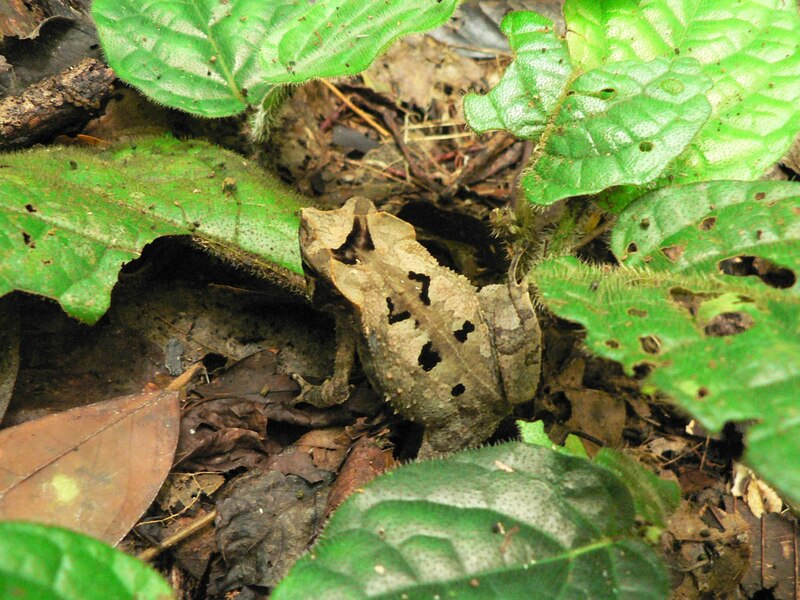 Jose immediately spotted a tiny, perfectly camouflaged frog, by the side of the trail, which set the tone for the following days as he repeatedly spotted birds and animals that were invisible to us. 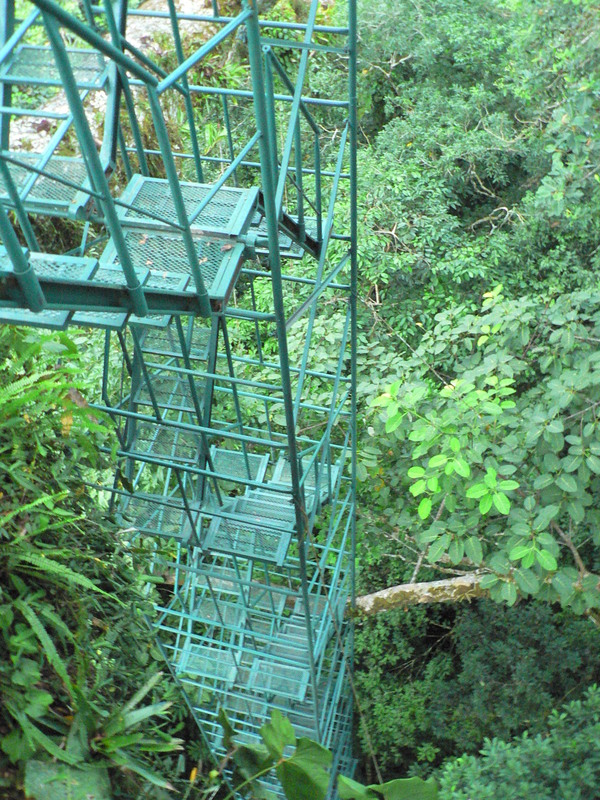 The canopy platform was 45 metres off the ground, in the vast branches of an enormous tree, themselves part of a complex ecosystem supporting bromeliads and climbing plants, birds, insects, and amphibians. To reach it, we climbed a metal tower, which became slightly more nerve-wracking with every flight of stairs. It was a cloudy day, so rather than sunrise we watched the light change and the forest wake up. 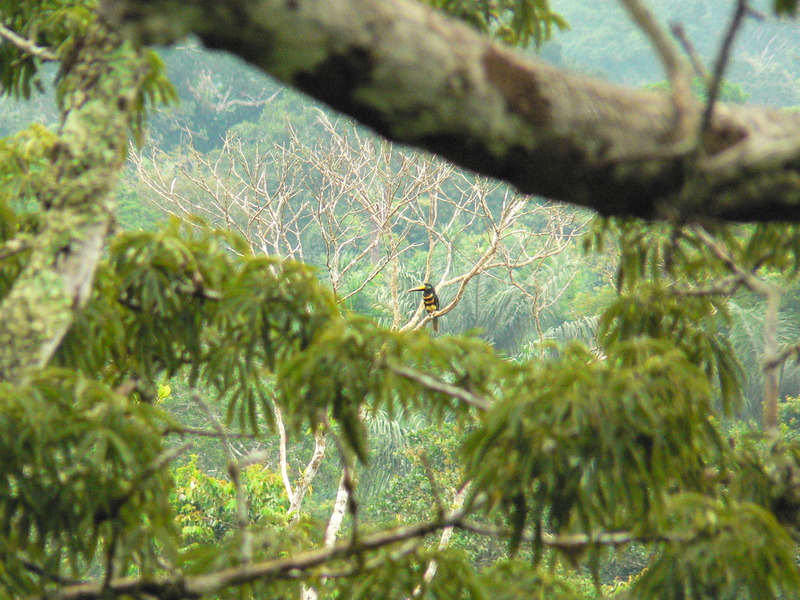 We soon spotted two gangly spider monkeys making their way between the tree tops, some distance away and beneath us. One, after reaching a new palm, re-caught a frond of the previous one while suspended by its tail, making a bridge for the smaller monkey to climb across. Scarlet macaws circled the tower in a spectacular flypast. 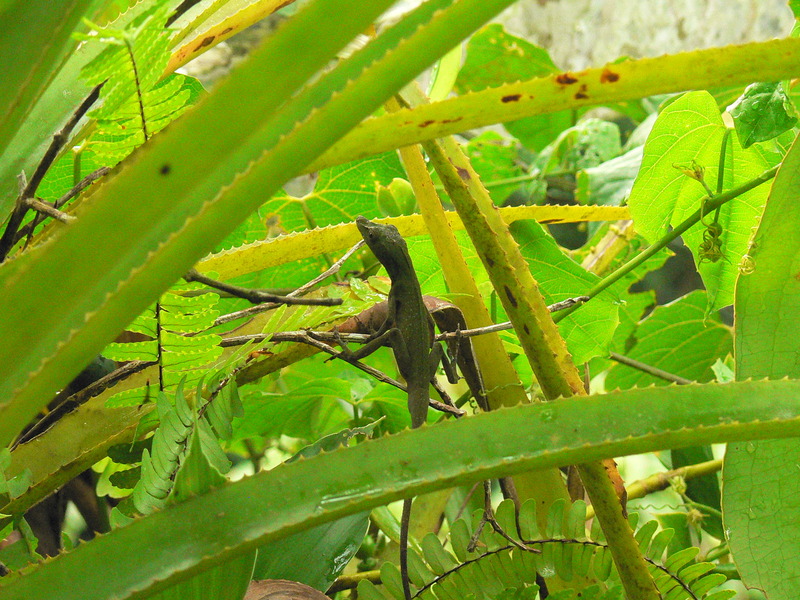 A hummingbird visited the epiphyte flowers, colourful paradise and opal-crowned tanagers were busy in the tree canopy above us, and a lizard froze and changed colour under our gaze. We spotted a many banded aracari, a puffbird, a bare throated fruit crow, and vultures hunched among bare branches in the distance. 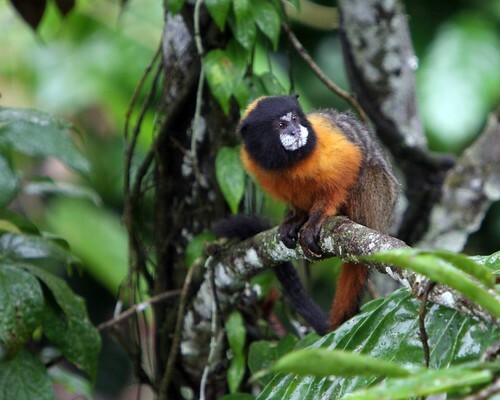 Back on the ground, we caught sight of our first primate species, the rare and endemic golden-mantled tamarin. After a huge lunch and a siesta, we were back on the trails, this time on a slow walk to a lagoon. On the way there we crept quietly off the trail – with Jose whispering instructions – and stood beneath a tree, craning our necks. 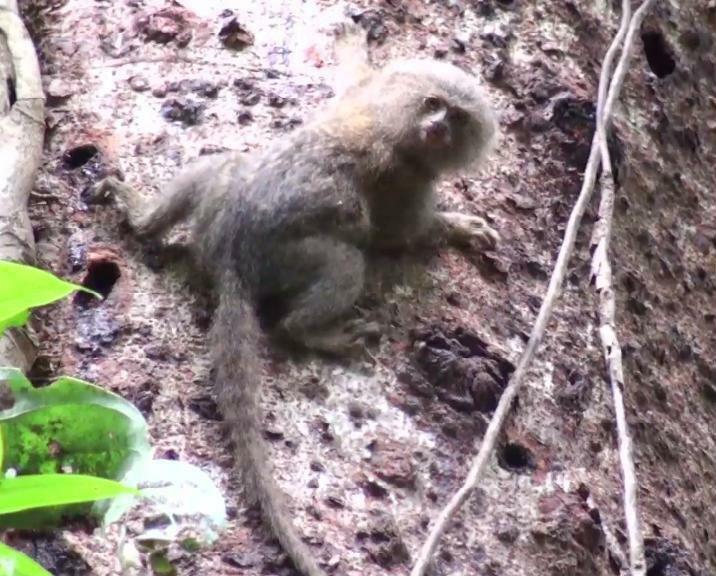 The inhabitants we were looking for were pygmy marmosets, the smallest monkey in the world. After a short while, a tiny, scrabbling gremlin skittered down the trunk. Further along the trail we saw dusky titi monkeys, woolly monkeys, and monk saki monkeys, bringing the first day’s total to six species of primate. 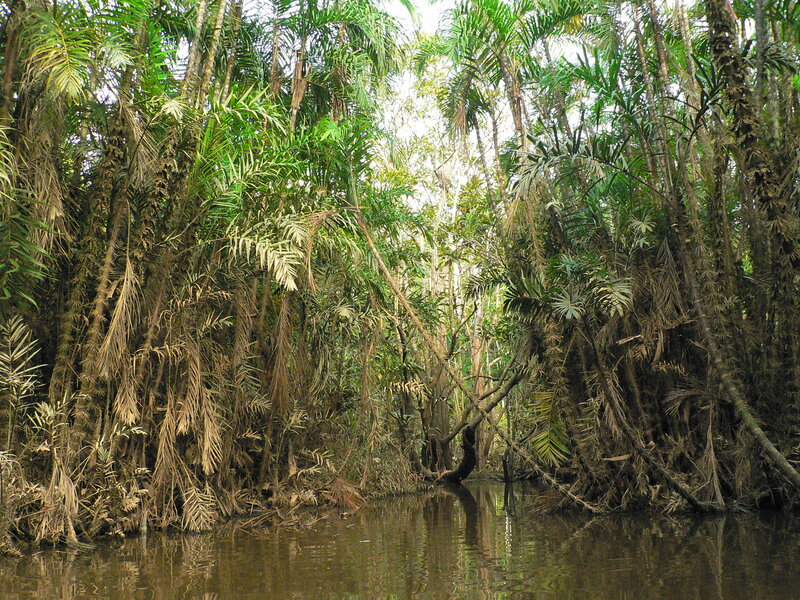 The lagoon itself was ringed by palms, the lower couple of metres of which were muddy from the high water during the rainy season. We paddled quietly across the water in a canoe. 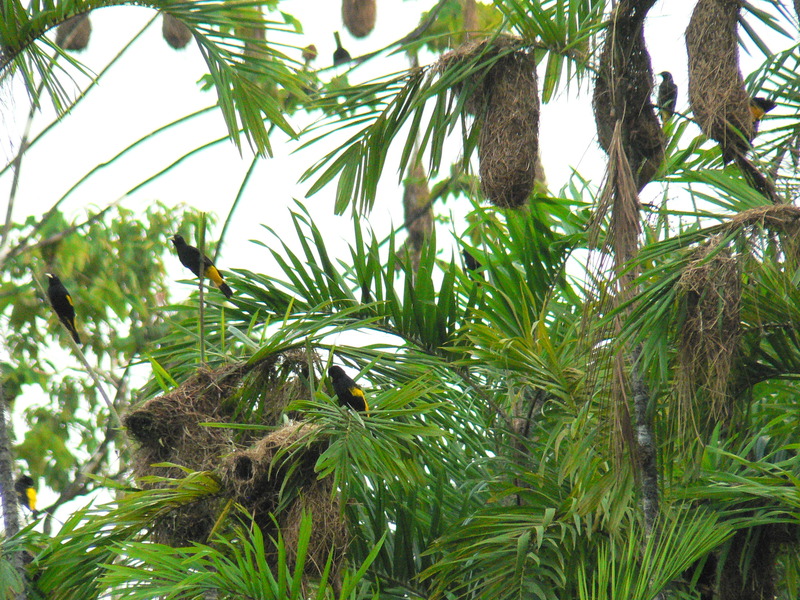 Hoatzins, a prehistoric dinosaur of a bird, huffed and crashed about in the branches, and caciques whirred about, noisily building their hanging nests. We also spotted an anaconda, motionless, under some low hanging branches. 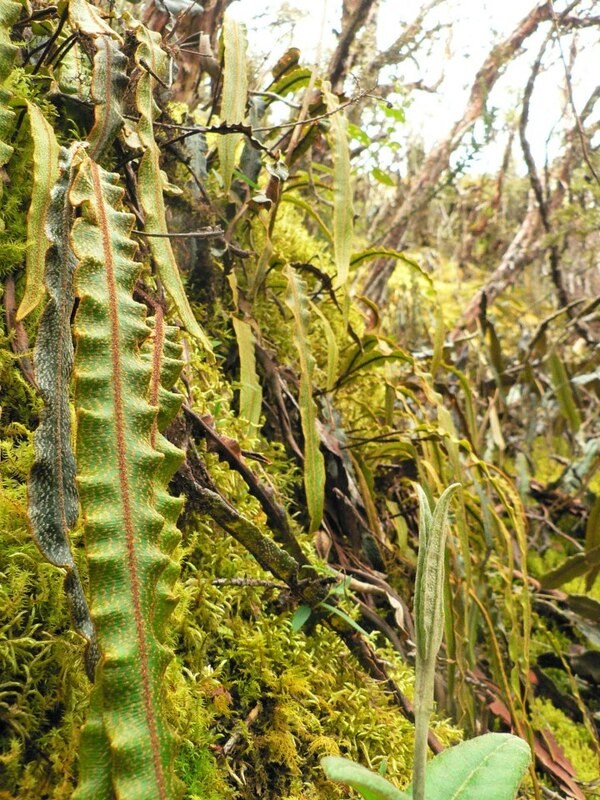 The most biodiverse place on earth was living up to its reputation. Whereas the first morning was spent observing the forest wake up from above, the second found us in a boat, travelling downstream on the Tiputini river. We were heading for a parrot clay lick, a part of the river bank where flocks of parrots congregate each day, to get vital minerals from the soil. As we rounded a bend in the river we came across a submerged tapir, which lumbered up and out of the water, and disappeared up the bank. Kingfishers, disturbed by the boat engine, seemed to lead the way, pausing on a branch ahead of us only to take off again as we got close. Turtles plopped into the water, and night herons stood guard at the water’s edge. Once in position, we watched as parrots gathered in the cecropia trees above the lick, and eventually, after much noisy chatter, they descended and continued to excavate a small cave out of the bank. Once or twice they were spooked by something, a huge flock rising and circling before returning to eat some more. On our way back, the boat slowed, and Jose gestured that he had seen something in the water. We were then led a merry dance by three pink river dolphins, noses and fins appearing behind us, then in front of us, but never alongside the boat. Later that evening we were on the river again, scouring the banks with a huge spotlight, looking for reflected eye-shine of caiman. 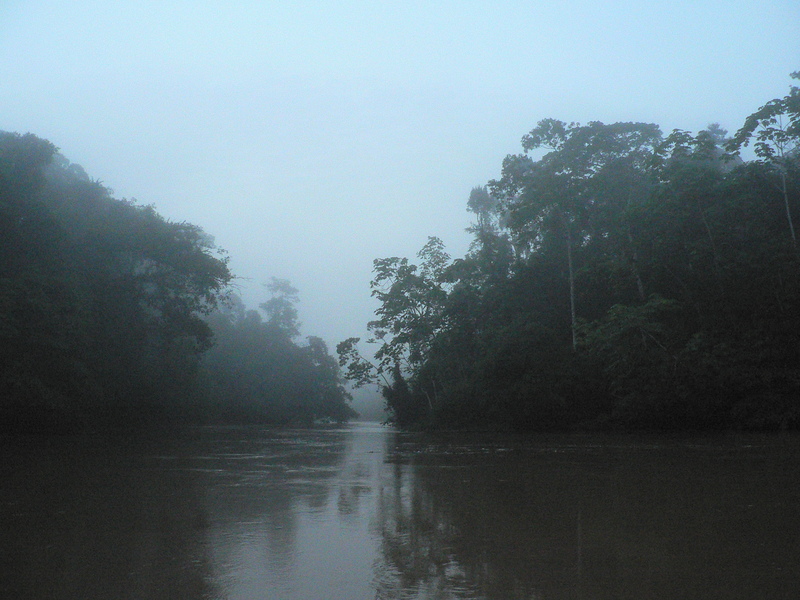 The jungle at night feels like a different world, and it was cool and breezy on the boat, watching nightjars, and alert for animals on the riverbank. Then it was to bed, to be quickly lulled to sleep by the rhythmic chirps, whirrs, pips, buzzes and croaks of insects and frogs in the absolute darkness. 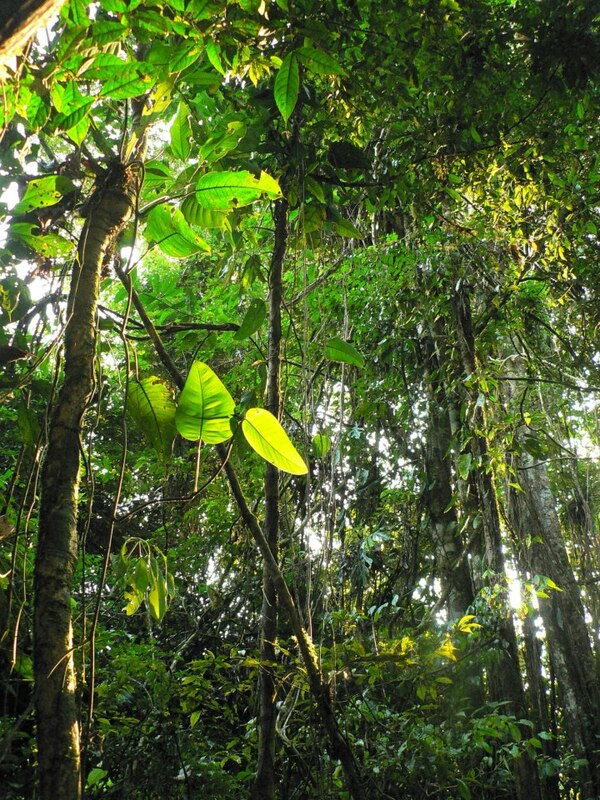 This recording gives a taste of the Amazonian night time soundscape. 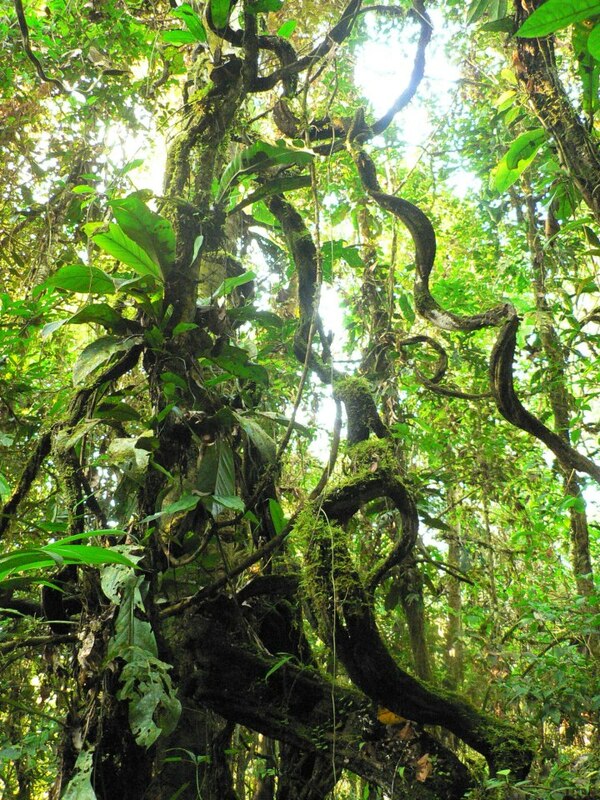 We flew from Quito to Coca, in the Ecuadorian Amazon, to get to Tiputini Biodiversity Station deep in the rainforest. It was a tough choice, whether to take the bus or plane, and flying felt like the shameful, hypocritical choice given the region’s controversial and damaging oil extraction in recent decades. The alternative for the return trip was 2 days of treacherous mountain roads in the rainy season, and two nights in Coca, a busy, polluted town, home to local communities and oil workers. The flight was half an hour each way. It is this convenience, and our expectation to take the quicker, simpler journey, that has helped us become dependent on oil. 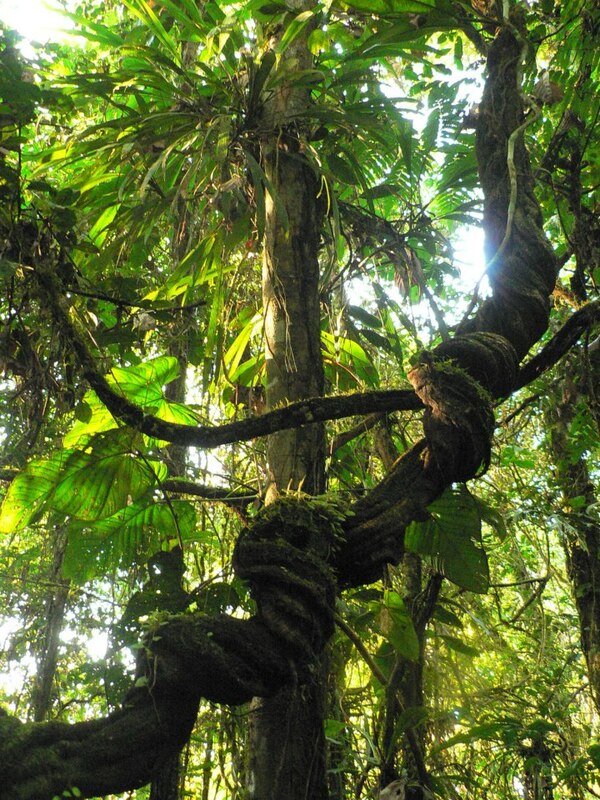 We are now so desperate to find new oil fields to exploit, that one of the most biodiverse places on earth, Yasuni National Park in Ecuador, could be irreversibly damaged to meet our fuel demands. If this does happen, then in exchange for the suffering of indigenous peoples and the destruction of biodiversity, we would gain enough oil to keep the world running for about a week. It seems a ludicrous choice to make. However, just like the many passionate scientists working in the depths of the forest at Tiputini Biodiversity Station, fly we did. Stepping off the plane was like stepping into a sauna, hot and muggy, but instead of the heady smell of tropical rainforest we were greeted by an unpleasant mix of traffic fumes and smoke. 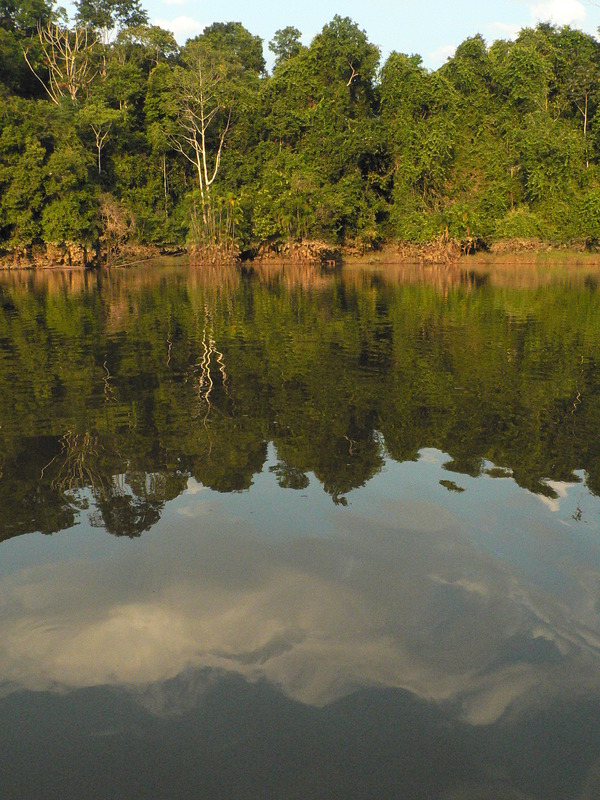 Before long we were in a boat on the Napo river, heading downriver, the banks so far apart that the mighty rainforest – where it was still standing and hadn’t been cleared for oil or agriculture – appeared to be no more than a hedge along each side. 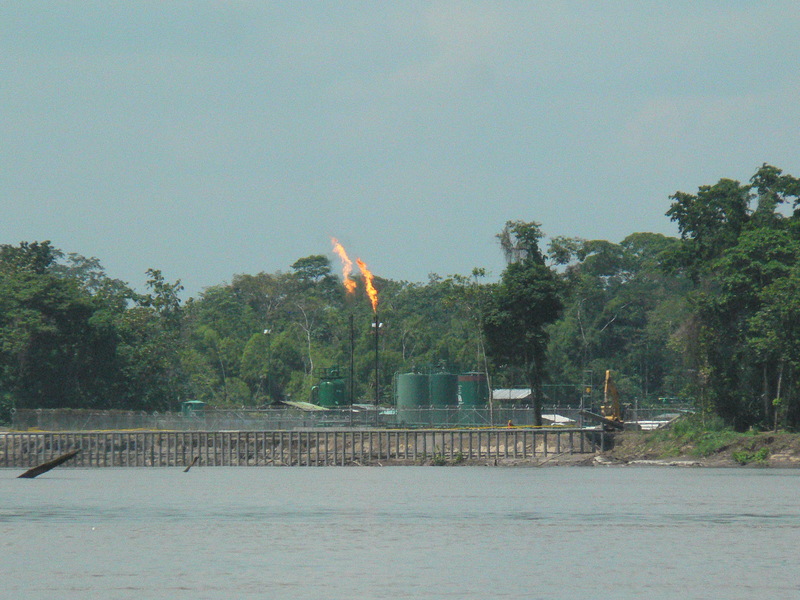 We passed a gas flare burning on the banks, and were overtaken by speedboat ferries taking their cargo of workers to the oil and gas extraction sites. After an hour and a half we arrived at a checkpoint owned by Repsol YPF, a Spanish-Argentinian oil and gas company that controls access to a road that would take us to a second boat on the Tiputini river. We filed through, our bags were x-rayed, and we drove for an hour, on a bus with no sides and hard wooden bench seats, along the gravel road. Repsol YPF are so sensitive to security that photography is forbidden. 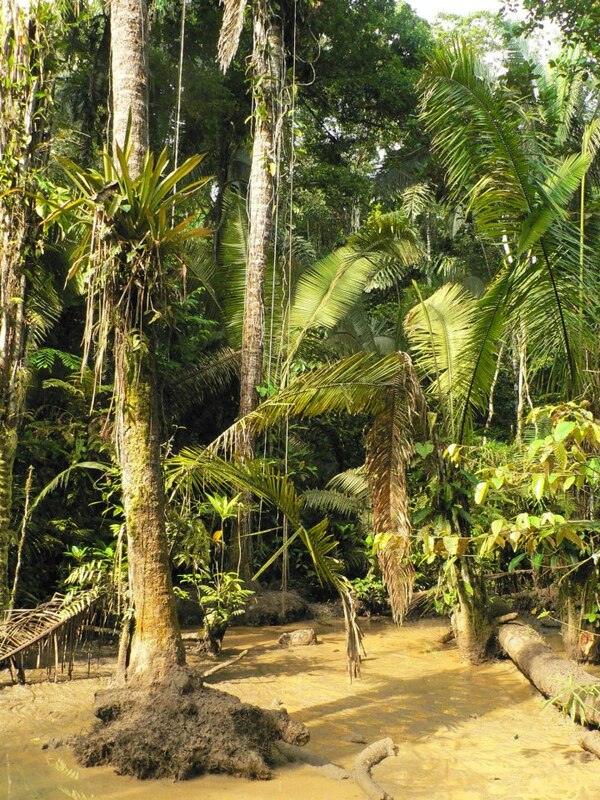 This region was first and foremost home to the indigenous Huaorani people. The Huaorani remain, some living in wooden homes built for them by Maxus (the Ecuadorian company that originally constructed the road) that bear no resemblance to their traditional houses. We saw these, and paths disappearing into productive crop gardens, drove over rivers with signs giving their indigenous names, and saw dugout canoes in the water beneath us. We learnt a great deal more about what we had seen later in the week, when a presentation and documentary on the road and Huaorani communities was shown at the research station. The road itself, necessary for the transport of oil, resulted in direct deforestation, but as discussed in a previous blog, roads bring people which lead to further deforestation. To prevent colonisation along the road, the oil company became guardian, hence the checkpoint. It was alleged that at one point, unsure what to do with a particular waste product, and apparently seeking to fulfill an obligation to be of benefit to the local communities, this waste was spread on top of the gravel road to keep dust levels down. Not only was dust not a problem to start with, this toxic waste soon washed off in the rain, and into the surrounding soil and water. It was also alleged that the education that has been provided by the oil companies has been a failure, with the level of education so poor that school graduates are not employable in towns, where many now wish to live and work. 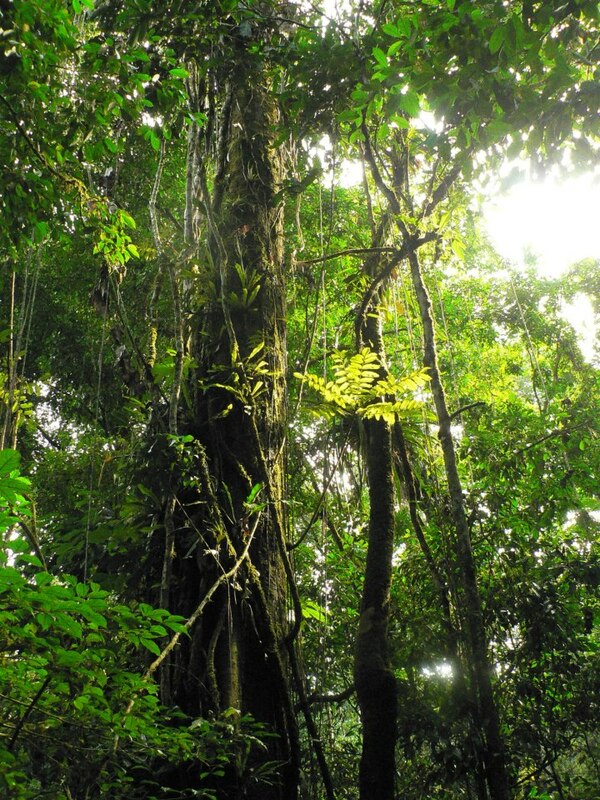 We heard anecdotally that it has also deprived them of their chance to develop the knowledge of the forest that is needed to live as previous generations have done. As a result, school graduates now often end up as beggars in town, or reliant on an elderly relative who will support up to twenty people in the forest. From what we heard and saw, it appears that the social fabric of this Huaorani community has been destroyed. The road remains gravelled and not paved so that one day the forest can grow back… when this was explained to us it was met with a grim, hollow laugh, as if this small token gesture would redeem the companies of the devastation they have caused. While extraction practices now need to be seen as far more socially and environmentally responsible, the fact that the gas fields are now harder to reach, and the grade of the oil much lower, means that extraction will be increasingly energy intensive and destructive. One must only look to neighbouring Peru, where the sadly familiar dance between government, oil companies and indigenous people is also taking place, to see oil companies acting in their own interests despite their statements to the contrary. In Peru, the very existence of groups in voluntary isolation is denied by the oil companies who want to work in their territories, despite clear evidence that indigenous people are present. Seeing the effects of our thirst for oil, as first-hand as we were able, was shattering. 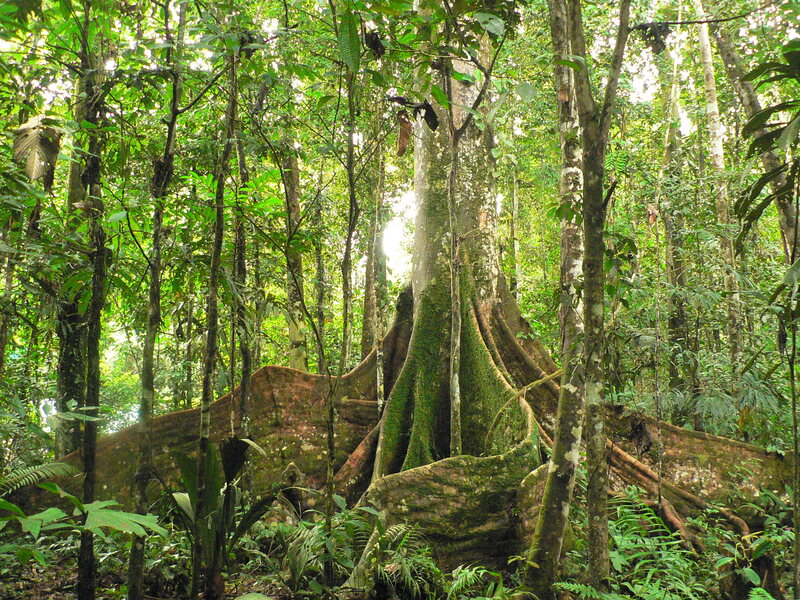 An understanding of what is at risk makes it even more difficult to contemplate the effects of further extraction, encroaching more and more on areas like Yasuni National Park. Since we visited, an oil spill caused by a ruptured pipeline (belonging to another oil company) resulted in 11,000 barrels of oil entering the Coca river, which then made its way downstream to the Napo, and onwards into Peru. 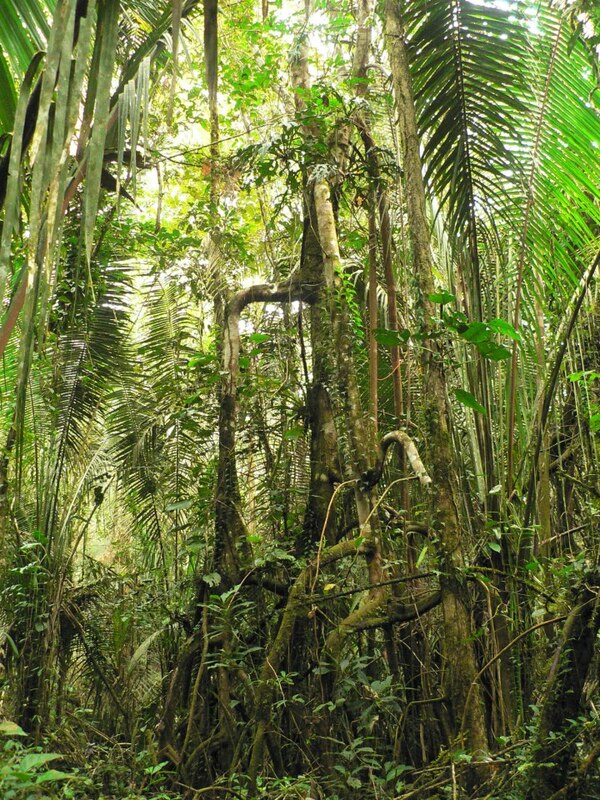 The Ecuadorian President, Rafael Correa, has offered an innovative solution to the conservation of the region: rather than continue with oil extraction, the oil will remain in the ground if the international community donates half the value of the oil to Ecuador, for use in social and environmental projects. This would amount to $3.6 billion, over 13 years, which in global economic terms is the bargain of the century (this ‘Billion Dollar-o-Gram‘ helps put it in perspective). 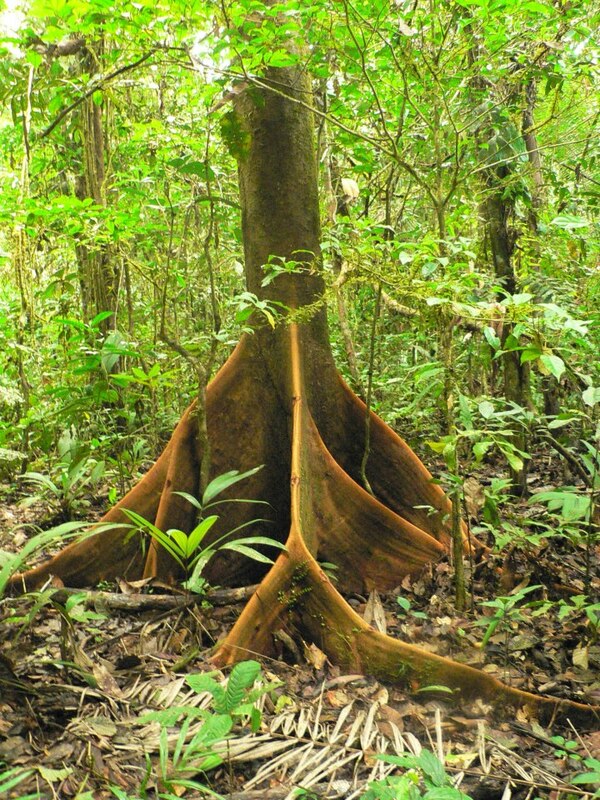 But even this – a simple lifeline for some of the last pristine rainforest in the world – has been met not only with apathy by governments around the world, but with fierce criticism. Critics argue that Correa is blackmailing the world, and that his assurances cannot be guaranteed. The argument in favour asserts that as Ecuador could very much use the economic benefits of this oil, they should be compensated for foregoing its exploitation. I think it is a small price to pay to at least buy some more time to work out a cleaner way to exploit the oil reserves, or to come up with a sustainable alternative to oil, that we will need sooner or later anyway. Our bus stopped at the top of a bank above the Tiputini river, and we hobbled off. Huaorani families were washing, playing, and fishing in the river, small children giggling, and a woman cackling with laughter as she shared jokes with our guides and coaxed a fishing line. This was the last leg of the trip, down the much narrower, meandering Tiputini. Trees hung low over the water. We spotted monkeys, herons, kingfishers, and still life arrangements of turtles on half-submerged branches, who would tip sideways into the water as we went past. 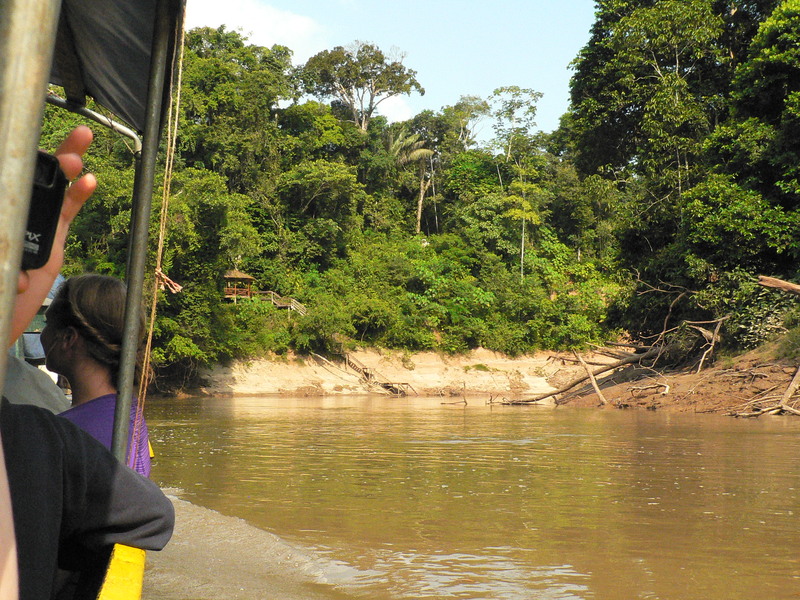 We were scouring the trees for wildlife, and hoping against hope for a jaguar on the bank, as river travel is often the best way to see a big cat in the rainforest. 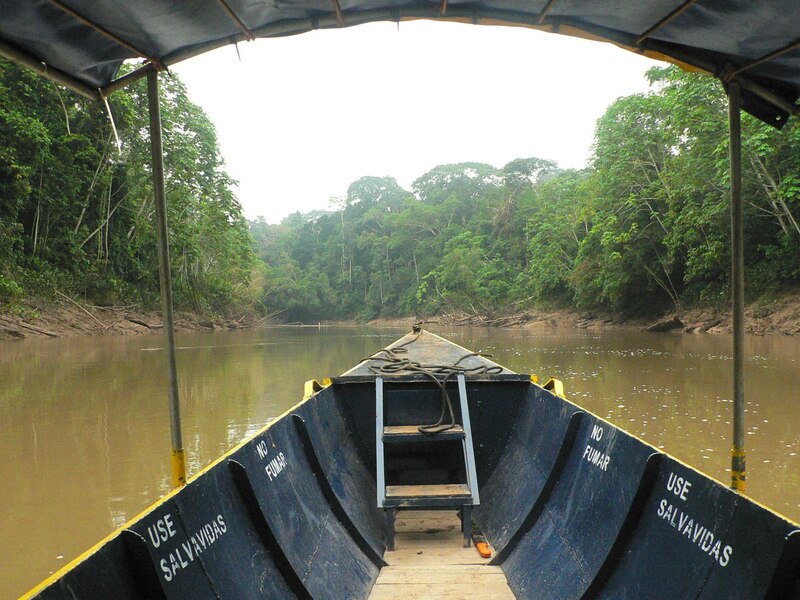 A boat on a narrow jungle river is one of my favourite places to be, and the hour and a half it took to reach the research station was a joy. As the afternoon sun turned golden we rounded the final bend and saw wooden steps rising out of the water, leading to a roofed platform, beyond which lay the dining room and narrow trails leading to cabins in the forest. The journey had been long, and had shown us one of the uglier sides of the world, before ending in one of the most beautiful places on earth. 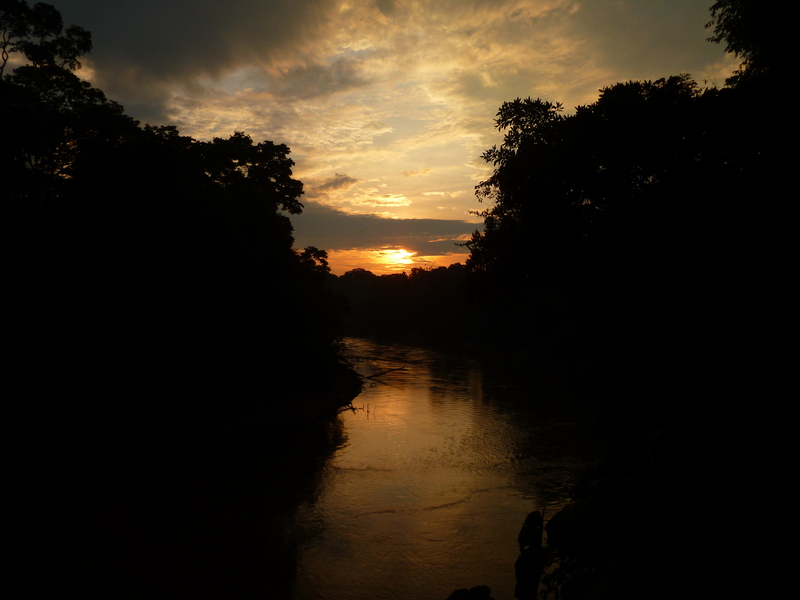 Without the sound of the boat engines, the jungle noises could now be heard, and we sat and watched the water flow round the bend beneath the station, as the light faded, macaws flew back to their roosts, and bats emerged to skim the surface of the water.